After Thanksgiving week, I am especially thankful school has started again! ;o) Faith was so ready to go back and our routine is much better when she has activities to do during the week. 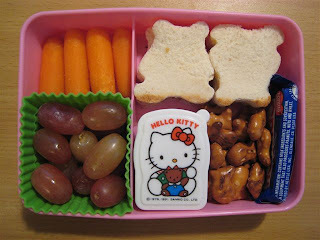 For lunch, she had teddy bear sandwiches, carrots & grapes, goldfish pretzels, a mini Crunch bar, and her HK container filled with Yogos. :o) Yogos get messy if they aren't separate from other foods.